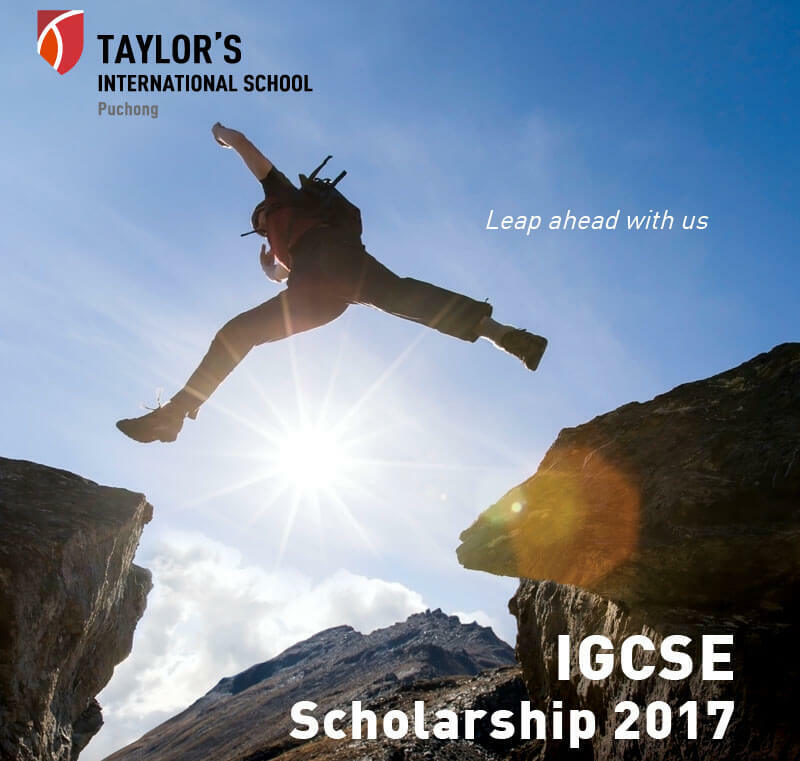 The IGCSE Scholarship 2017 is offered to Malaysian students who are keen to enrol in Taylor’s International School Puchong in Year 10 and subsequently Year 11, leading to the International General Certificate of Secondary Education (IGCSE). This is a 2-year scholarship programme awarded based on the strength of the student's academic performance, co-curriculum involvement and their family's financial situation. 100% waiver on application fee, registration fee, tuition fee, technology fee as well as the security deposit. 1. Malaysian students who are currently not enrolled in TIS Puchong and cannot normally afford to attend an international school but demonstrate potential for excellence. 2. Students who are born in the year of 2002 and eligible to enter Year 10 in January 2017. 3. Students with high academic achievement and high proficiency in English. 4. Students with active participation in co-curricular activities and outstanding record of service to school or community. To apply, students need to fill in the application form and send it to the Principal Office. 1. A personal essay statement. 2. School recent reports and certificates (all must be certified copies). 3. A letter of recommendation from School Principal or Teacher. No. 1, Jalan BP 14/7, Bandar Bukit Puchong 2, 47120, Puchong, Selangor. 0 Komentar untuk "Taylor’s International School Puchong - IGCSE Scholarship 2017"